Incoming students will find enclosed an orientation packet, containing a guide to the supernatural powers you and your classmates possess. New faculty will also find guidleines for curriculum and an extensive listing and descriptions of over fifty dangeorus demons, the creatures you will be teaching our students how to defend against, Demongate High is where you, as a student or faculty member, will learn to use your supernatural powers to truly make a difference in the fight against the demons that impinge upon our world. 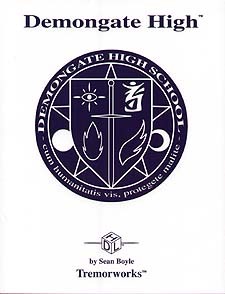 This game setting, for use with the HDL Basic Rules, includes all the information needed to create a variety of paranormal superhuman characters in the unique high-school setting of Demongate High. Included are new backgrounds and skills, details on classwork, field trips, potential student adventures, and additional information on the world of the supernatural. To use this book, players also need the HDL Basic Rules, and each gaming group needs a set of HDL Cards (sold separately). And you thought high school would be boring.